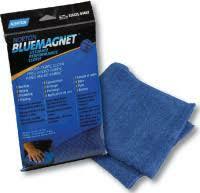 Blue Magnet can be used dry or slightly damp to easily remove dirt, grease and dust. It is suitable for most surfaces, metal body, painted surfaces, glass, plastic and leather. Blue Magnet is the ultimate performance cleaning cloth for general purpose applications such as dusting, drying, polishing and waxing. Absorbs 8 times it’s own weight in water, dries faster and better than chamois material and is ultra soft, reusable and machine washable.